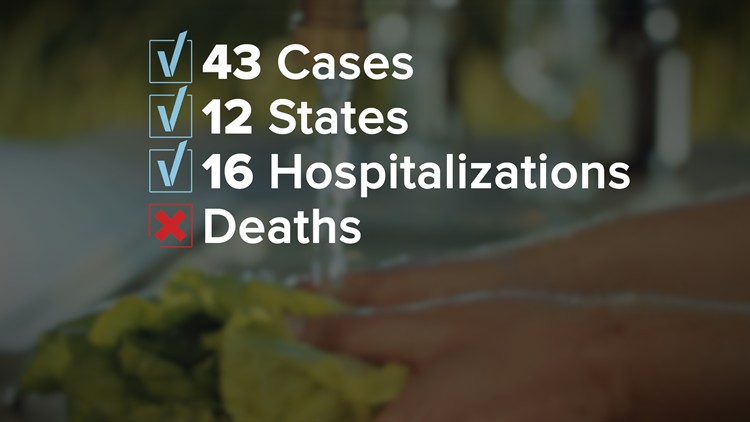 An E.Coli outbreak in late November saw people across the country throwing out romaine lettuce to avoid E.Coli. According to the Centers for Disease Control, there have been 43 reported cases of the E.coli 0157:H7 strain found in the U.S., as of November 28th. This strain is known to cause severe stomach cramps, diarrhea, vomiting and in rare cases can lead to kidney failure. It’s also advised that doctors don’t treat it with antibiotics as that can increase the kidney failure risks. Is this true? Did President Trump or his administration overturn any regulations that would’ve required water testing in farms? No, the rules and regulations put in place under the Obama administration have not been removed, replaced or “overturned” as this post claims. The FDA has postponed the compliance dates for certain regulations that would have begun to take effect in 2018 - including testing of “agricultural water” on farms. Put another way - no one overturned or removed regulations, they just pushed back their start dates. In 2016, standards for a variety of food safety measures were put into place by the FDA. They were based on requirements listed in The Food Safety Modernization Act (FSMA) passed in 2011. Among these standards was a focus on “agricultural water” and required testing for E.coli and other pathogens that farms would need to begin performing. The rule required any water to be removed from use and cleaned/sanitized if any generic E.coli was detected. Do an initial survey, using a minimum of 20 samples, collected as close as is practicable to harvest over the course of two to four years. The initial survey findings are used to calculate the GM and STV (these two figures are referred to as the “microbial water quality profile”) and determine if the water meets the required microbial quality criteria. If the four initial sample results meet the no detectable generic E. coli criterion, testing can be done once annually thereafter, using a minimum of one sample. Farms must resume testing at least four times per growing season or year if any annual test fails to meet the microbial quality criterion. For untreated ground water that is used for the purposes for which no detectable generic E. coli is allowed, the FDA requires farms to initially test the untreated ground water at least four times during the growing season or over a period of one year. Farms must determine whether the water can be used for that purpose based on these results. For untreated ground water that is directly applied to growing produce (other than sprouts), the FDA requires farms to do an initial survey, using a minimum of four samples, collected as close as is practicable to harvest, during the growing season or over a period of one year. The initial survey findings are used to calculate the GM and STV and determine if the water meets the required microbial quality criteria. Sound complicated? Farmers thought so too. In a September 2017 speech to the National Association of State Departments of Agriculture (NASDA), FDA commissioner Dr. Scott Gottlieb said they’d received feedback from farmers. “One consistent and clear message we received throughout our outreach to farmers and state agriculture officials is that the microbial quality standards for agricultural water are too complicated, and in some cases too costly, to be effectively implemented,” he said. 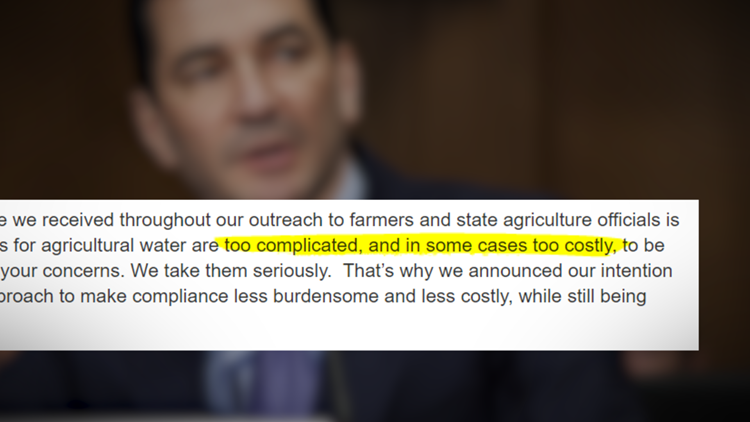 Gottlieb announced that the FDA would issue a “proposed rule” to extend compliance dates for the agricultural water requirements by 2-4 years. If approved, it would move compliance dates for the agricultural water rules back to 2022-2024 depending on the size of the farm. The proposed extension of deadlines has not been officially approved or made law, but in the meantime as the enforcement agency, the FDA has said they will not enforce their regulations until the matter is sorted out. “The FDA does not intend to enforce the agricultural water requirements for covered produce other than sprouts while the rulemaking to extend the compliance dates is underway,” their website reads. Many farmers in California and Arizona are part of the LGMA. It’s an independent certification board aiming at increasing food safety standards in their growing regions. Their site details a number of standards they hold their growers to - including stringent water quality testing. According to LGMA CEO Scott Horsfall, their requirements are stricter than the coming regulations from the FDA. Horsfall said the two E.Coli outbreaks of 2018 are clear indications of the importance of diligent and frequent water quality tests - something their members have been doing since 2007. But even with LGMA members maintaining strict quality reports and records, farms in the same states have been linked to this current outbreak and a previous E.Coli outbreak in Yuma, Az. While Horsfall said the LGMA supports the “irrigation water” standards detailed in the FSMA, he said he had no reason to doubt the FDA’s reasons for postponing their required compliance dates. And since the regulations wouldn't have taken effect at all farms even pre-postponement, he said it’s unlikely that anything would have changed in the current situation even if they had been in place. “I don’t think there’s anything in the regulations as written that would’ve caused anyone to do anything different.” he said. 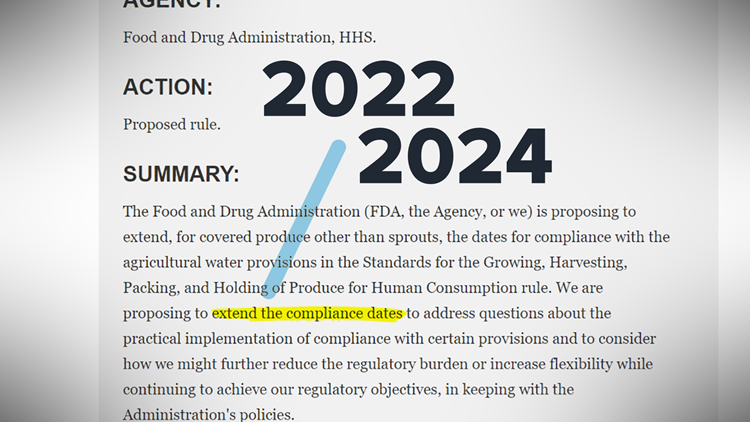 The FDA under President Trump has sought to move required start dates for “agricultural water” testing back to 2022-2024. Those rules will take effect on those dates, or possibly sooner if the proposal is denied.